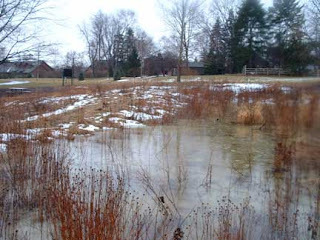 Buhr Park Children's Wet Meadow Project: Design Vindicated! 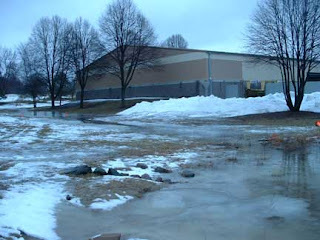 This afternoon's rainfall and snowmelt combined with frozen ground to yield large quantities of surface run off. The three basins of WM II functioned exactly as designed - the swale behind the ice rink fed the upper (northernmost) basin. 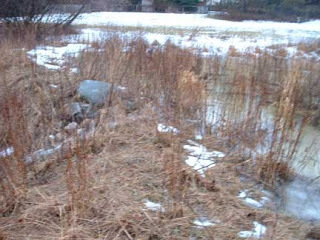 When that filled, it overflowed through its spillway to the middle basin. That one, in turn, filled and overflowed to the lower basin. It's the most water I've seen since WM II was built in 2004. Hats off to Jane Kleiner, the designer, Chris Mueller who excavated the basins and built the spillways stone by stone, the teens who helped plan, and everyone who helped. Mark - these are great pictures. I was there a few weeks ago and listened to the water trickling between the rocks.